Neurology Solutions Movement Disorders Center is offering same-day DBS troubleshooting evaluations for new patients to assess deep brain stimulation problems and failures. Our DBS evaluation is for individuals with DBS seeking a second opinion about programming to achieve better results. Patients who have been implanted with DBS for Parkinson’s, essential tremor or dystonia will receive an initial 1-1/2 hour medical consultation with an experienced DBS programmer, including 15 minutes of analysis and supervision by Neurology Solutions Medical Director Dr. Robert Izor. Multiple visits with the Neurology Solutions team may be necessary until optimal results are achieved. Brain scans and surgical reports may be required to allow a complete assessment. The Neurology Solutions team has the most experience in Texas implanting and optimizing DBS. Neurology Solutions’s founder and Medical Director Dr. Izor is a board-certified neurologist and fellowship-trained movement disorder specialist. Affiliated with St. David’s Medical Center, he has attended over 300 DBS surgeries and offers provider education and training in DBS. Neurology Solutions has five DBS programmers with over 35 years’ combined programming experience. Neurology Solutions providers oversee the post-operative management of more than 150 patients with DBS. The clinic sponsors a monthly DBS Support Group, which is open to individuals in the Austin area who have undergone DBS surgery as well as those considering this option. Patients with DBS require diligent reprogramming and medication adjustments as their disease progresses. Many symptoms that worsen after DBS can be improved with careful evaluation of the variables that can lead to worsening symptoms. Neurology Solutions will thoroughly analyze your DBS system as part of your DBS evaluation to determine adequate medication dosing, optimal lead placement, and to investigate problems related to stimulation or hardware. Weekly visits will be offered until optimal results are achieved, usually between 10-15 programming sessions. In some cases where DBS is yielding unsatisfactory results electrode replacement is necessary to achieve optimal results. If the leads are not well placed, we will review options for lead revision and newer technology that may provide greater benefit and flexibility. The initial DBS troubleshooting evaluation visit is typically covered by insurance. A referral is not required by many insurers or Medicare: however, a referral may be required if you are insured by an HMO. In such cases we will be happy to see you, but you may be responsible for any charges your insurance does not cover for your first visit. In such cases, we will bill you directly at a discount from our regular fee. The cash/credit charge after discount is $250. Neurology Solutions strives to make its DBS programming services easily available and affordable. A payment plan and/or other options may be available for patients who need financial assistance. Call Neurology Solutions at 512-865-6310 to make an appointment for a DBS troubleshooting evaluation. Neurology Solutions Movement Disorders Center opened in 2004 as the first subspecialty movement disorders center in Central Texas. 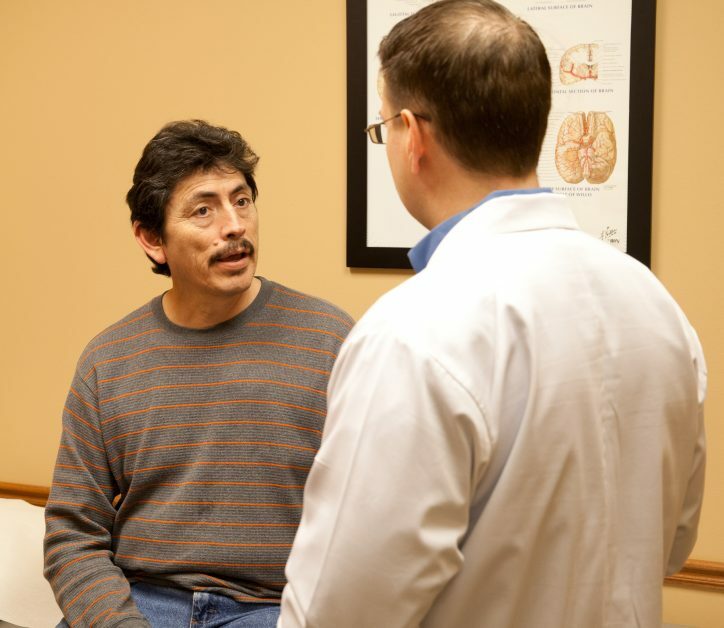 Neurology Solutions offers integrated interdisciplinary care, including physical and occupational therapy, medication therapy, injection therapy and surgical management for conditions such as PD, essential tremor and dystonia.